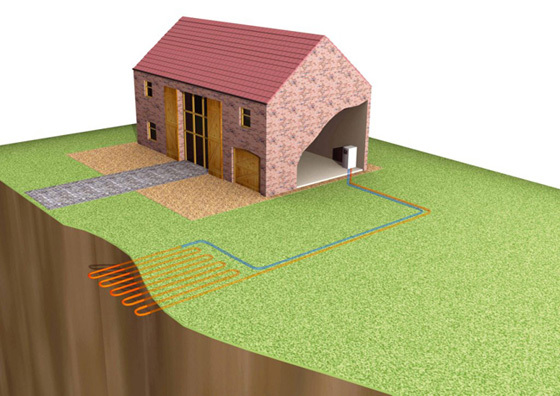 A ground source heat pump works in a similar way to a refrigerator. It removes heat from the ground, but instead of releasing it, the heat pump condenses it to a higher temperature. This can then be used for heating and hot water systems. For every kilowatt of electricity used to power the pump this system could generate four kilowatts or more in energy for your home. An Air to Air Heat Pump is designed to provide heating and cooling for the home all year round. Features such as the advanced air purification technology which neutralises airborne bacteria, viruses and allergies and is particularly beneficial to asthma and hay fever sufferers. The heat pump comprises an outdoor and an indoor unit, which convert latent energy in the air (even on the coldest days) into heat for your home. The outdoor unit extracts the energy in air outside the property. This heat, absorbed by refrigerant solution within the unit, is turned into hot air by the indoor unit and distributed within the property. Air To Air Heat Pumps require no additional components or radiators and in addition to improving the air quality in your home provide warm air in the winter months and cool air in the summer. Not to be confused with “Air- Con”. These units are extremely efficient producing 5 times more heat then the electrical energy they use. Air to water heat pumps extract energy from the outside air and use it to heat your home and hot water supply, through radiators, or under floor heating. Heat pumps work very effectively in outside temperatures as low as -20°C. The advanced technology is incredibly popular in Scandinavia and other parts of Europe, so it is more than suited to the UK’s comparatively mild winters. An air to water heat pump can produce up to four times more energy than the electrical energy it consumes.